Self care.. it's something we all talk about and hear about. But how much of our time do we really take out of our busy lives to truly switch off and have some 'me time'? I know I don't do enough for myself and I couldn't tell you the last time I did something special to treat myself. 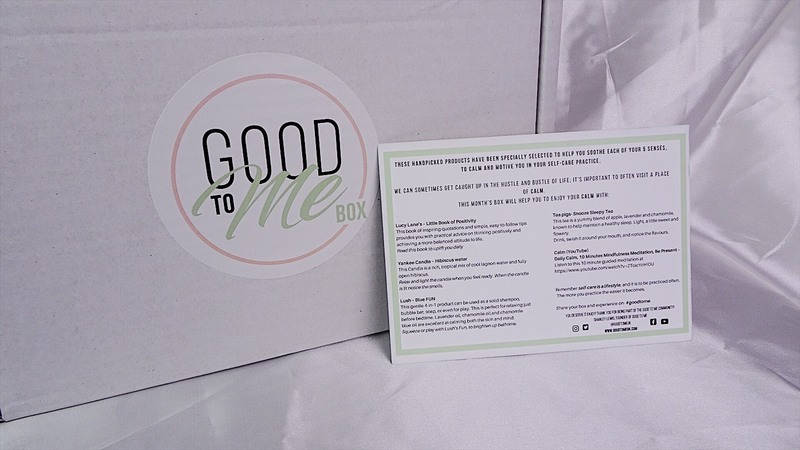 So, when I saw that a new self care company were starting up and wanted a few people to try out their new boxes, I put myself forward! Good To Me is a company that focuses on getting more of us to practice self care. It was founded by Shanley Lewis, who has first hand experience of those with mental health through her work as a Psychologist. She also has noted that taking time to practice self care has a positive impact on her mental well being. So, my box arrived and I could wait to open it! The box came beautifully packaged and you can tell that every care has been made to make each box special. 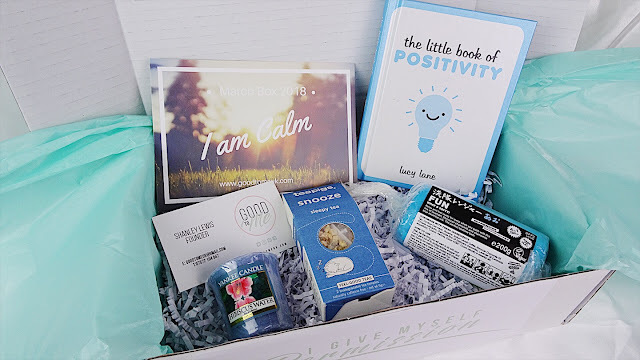 Each month's box has a different theme and the one I received a few months ago (HUGE apology for the delay in getting this post up!) was 'Calm'. 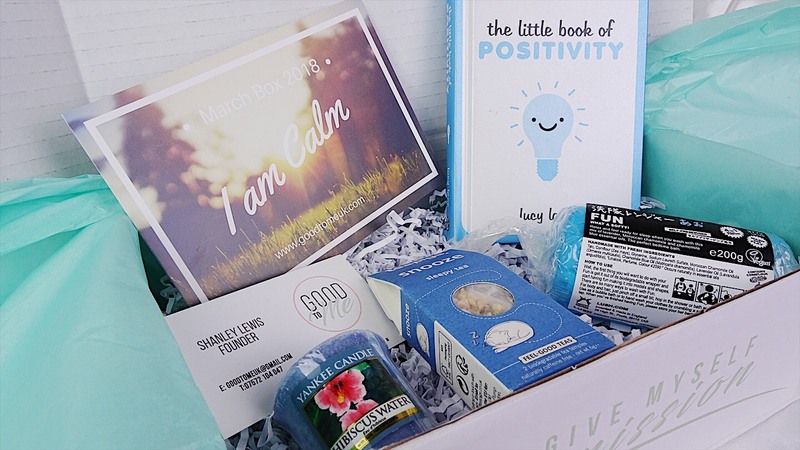 It focused on products that can help you feel calm and relaxed. My box included: 'The Little Book of Positivity' which has lovely little quotes in it that you can flick through, a Yankee Candle, Lush bubble bar, a mini packet of Tea Pigs 'Snooze' tea and a card explaining what each product is and how to use it. I've already used the candle which was such a gorgeous scent - I'll definitely be looking for the full sized version soon! The Lush bubble bar was something I had seen before but never tried. Mine had a lavender scent which is the number one go to when you need to relax! Again, I think I'd like to take a trip to Lush to see what other bubble bars are on offer. The tea was perfect for a hot drink before bed and the book is in my bedside table!! 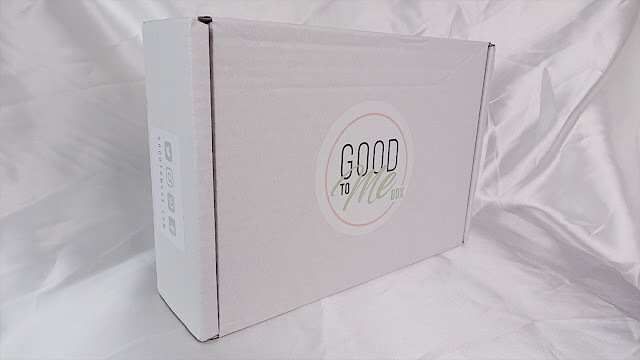 If you're interested in investing a bit more time on your self care routine, I highly recommend having a look into Good To Me. You can make a one time purchase of that month's box or enter into their subscription service where you will receive a box a month with a different theme. This has inspired me to put more effort into thinking about taking time for myself to just relax and be in the moment. Baths are my go to so I'll be on the hunt for products to use! It's important for all of us to be selfish sometimes and think about ourselves! 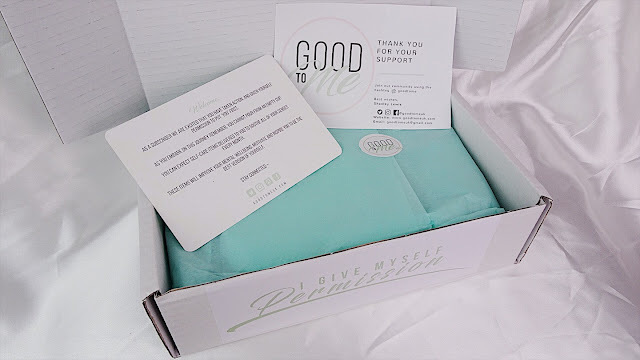 Thank you so much for Good To Me for sending me this box to review, and again I really apologise for the huge delay in getting this post prepared and posted!! 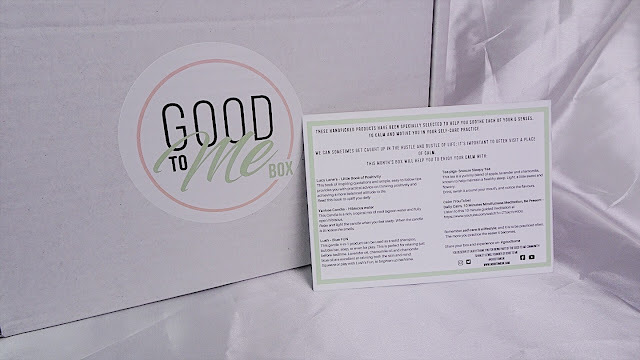 Here's some links to find out some more information about Good To Me! They're really active on their social medias and are always posting tips and inspirational quotes all to do with self care!